The Barcelona chair was exclusively designed for the German Pavilion, that country’s entry for the Ibero-American Exposition of 1929, which was hosted by Barcelona, Spain. The design resulted from collaboration between the famous Bauhaus architect Ludwig Mies van der Rohe and his longtime partner and companion, architect and designer Lilly Reich, whose contributions have only recently been acknowledged. An icon of modernism, the chair’s design was inspired by the campaign and folding chairs of ancient times. Lilly Reich began working for the Deutscher Werkbund in 1912, an organization whose raison d’etre was to focus specifically on the German design industry, its quality, evolution and promotion. Reich was responsible for designing and organizing many of the Werkbund’s international exhibitions, and in 1921 became the organization’s first female member. Reich’s affiliation with the Deutscher Werkbund and her architectural work with van der Rohe on their exhibition design and furniture design made them the natural choice for the Commission to design the German Pavilion in Barcelona. 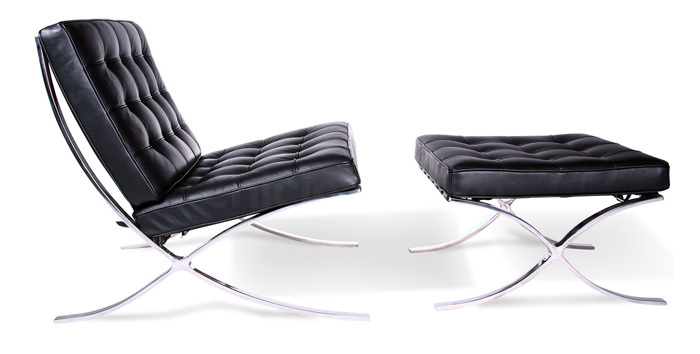 The Barcelona Chair frame was initially designed to be bolted together, but was redesigned in 1950 using stainless steel, which allowed the frame to be formed by a seamless piece of metal, giving it a smoother appearance. Bovine leather replaced the ivory-colored pigskin which was used for the original pieces. The functional design and elements of it that were patented by Mies in Germany, Spain and the United States in the 1930s have since expired. 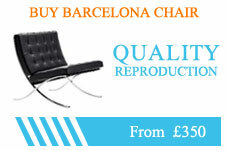 The Barcelona chair was manufactured in the US and Europe in limited production from the 1930s to the 1950s. In 1953, six years after Reich’s death, van der Rohe ceded his rights and his name on the design to Knoll, knowing that his design patents were expired. This collaboration then renewed popularity in the design. Knoll claims to be the current licensed manufacturer and holder of all trademark rights to the design. In 1965, Knoll purchased the trademark rights to the Barcelona word from Drexel. In 2004, Knoll received trade dress rights to the design from the U.S. Patent and Trademark Office. Despite these trademarks, a large replica market continues. Gordon International New York has continued to manufacture the designs since the 1970s, even after a court battle against Knoll in 2005. In 2008, another court battle erupted between Knoll and Alphaville Design California; the outcome is pending Summary Judgment in Federal District court.